Please direct any questions to calpolyforum@gmail.com. 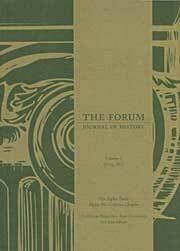 The Forum is a historical journal published at Cal Poly, San Luis Obispo by students associated with the Cal Poly History Department and the university’s chapter of Phi Alpha Theta. Through publication of The Forum, the members of the Alpha-Nu-Gamma chapter of Phi Alpha Theta hope to highlight the contribution of the Cal Poly History Department to the university environment, foster intellectual exchange, and showcase the significance and diversity of the field of history. Write an amazing paper for a Cal Poly history class! You must wait until you get your edits back to decide whether or not you want to submit another paper. If you chose NOT to revise and resubmit that paper, you must indicate that to the Executive Editors and indicate that you intend to submit a different paper. Only one submission will ultimately be considered for publication per volume, so choose wisely! If your first paper is rejected, you may submit another. Do I need to be a history major or member of Phi Alpha Theta to submit to The Forum? If my paper was rejected for one volume, am I allowed to submit it to the next volume?